This painting is from the largest and one of the finest illustrated works containing historical paintings from the Ottoman classical period. 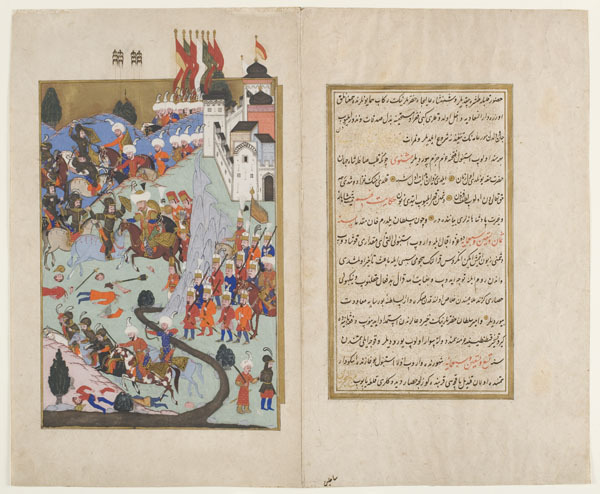 The manuscript, minus three- including this one- of its original forty-five illustrations, is now in the Topkap Saray Museum in Istanbul. It was completed by the court historian Loqman and copied by the calligrapher Sinan ibn Mehmed the Bosnian. Documentary evidence links the Ottoman court painter Osman and several other famous artists to the work. Individual paintings have not, however, been attributed to specific artists. The Turkish text of this folio is taken from an account of the rule of Ottoman Sultan Bayezid I (reigned 1389-1403). In 1396 Venetian and Hungarian Crusaders besieged the Bulgarian fortress of Nicopolis, which was held by the Ottomans. Although Bayezid I was at that time attempting to take Constantinople from the Byzantines, he abandoned his campaign to hurry to Nicopolis, where he inflicted a crushing defeat upon his Christian rivals. In this illustration, he appears as the mounted swordsman with the large, multiplumed turban in the center of this painting. The image appears on the left side of a double folio; its related text follows on both sides of the adjoining page.